Dental implants have rapidly replaced dentures and dental bridges as the gold standard for replacing missing or failing teeth. They halt and reverse jawbone loss, provide a stable and secure foundation for dental restorations, eliminate issues such as slipping and pinching, and restore nearly all the original bite strength. Yet there is no denying that dental implants are expensive. Here are some financing options you may not have considered. There are many costs involved with dental implants. To make this easy to understand, we divided the cost into 2 phases: “Surgical Phase” and “Restorative Phase”. The Surgical Phase consists of the implant placement which may includes extraction of teeth and bone grafting to bulk up the jaw. The Restorative Phase consists of the abutment and crown over the implant. You might also need to have other dental work done, as implants can only be placed in a healthy mouth, and you may even need bone grafting to build up your jawbone enough to support the implants. We will give you an itemized treatment plan that includes a full breakdown of costs. You will know exactly what each step costs, as well as the total price of treatment, before we begin. Unless you are getting an All-on-Four the same day as your teeth are extracted, dental implants involve a multi-step process with healing time between each step. We can break up your treatment plan to maximize what your insurance will pay. For example, we can extract your teeth at the end of your plan year, and then place your implants at the beginning of your next plan year. If you have excellent credit and are disciplined about paying off credit card balances, a low-interest or no-interest credit card can be an excellent way to finance your dental implants. Shop around for a credit card with no annual fee and a rewards points program you will actually use. Do not choose this option if you are not good at managing credit. Running yourself into potential bankruptcy is not a good solution when other financing options are available. 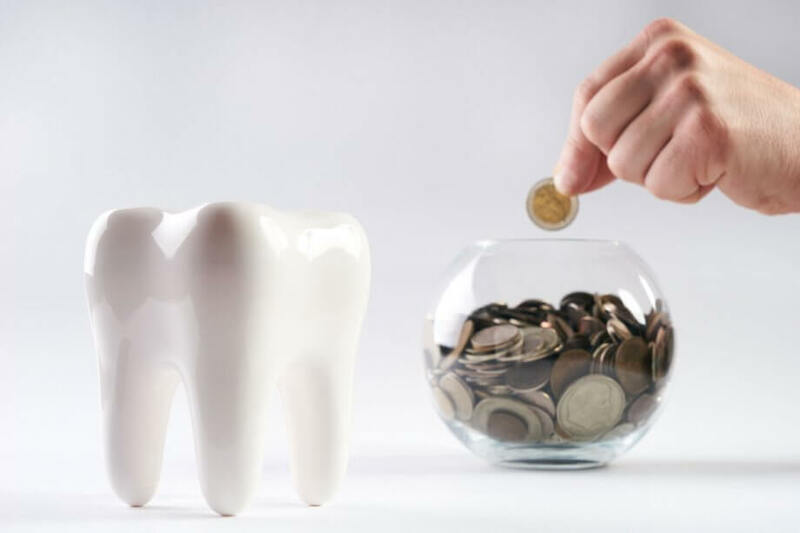 We work with a number of third-party financing companies to make your dental care more affordable. Care Credit, Wells Fargo Health Advantage and Greensky Financing are is specifically designed to finance health care, including dental work. It is far easier to be approved for a third-party financing company than a traditional credit card, so it is worth applying even if you have bad credit. Expensive procedures such as dental implants often qualify for zero-interest promotions. A flexible spending account (FSA) lets you put aside up to $2650 per year, pre-tax, to cover certain medical and dental expenses. This option is not right for everyone, as there are limitations and tax implications. If you have an FSA, though, it can be an excellent way to pay part of the costs for your dental implants. Dental offices are passionate about helping patients find a way to afford needed dental care. We offer a variety of in-house financing plans to help our patients afford dental implants. Never hesitate to bring up your financial concerns, and we will do our best to work with you. If you are in Lodi, and you are ready to learn how dental implants could change your life, please contact Dental Associates of Lodi today at (862) 247-8030 to schedule your initial consultation.